Residential awnings enhance the your home and increase value and function. If you are in the market for ways to beautify the exterior and style of your home without engaging in lengthy, expensive, and inconvenient repairs, then a brand new residential awning may be your answer! A residential awning tremendously enhances the appeal of any space and has practical as well as aesthetic benefits. 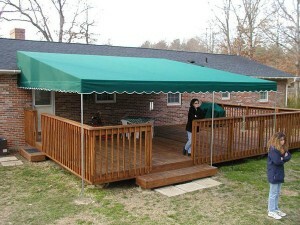 The many benefits of a brand new residential awning are outlined below. The residential awning comes in a vast range of colors, shapes, and styles, so you can truly pick one that compliments your home and suits your unique tastes. Residential awnings have diverse applications because of this. They can be used for patios, entryways, windows, and a number of other places in your home. They can be installed virtually anywhere you want. If you are interested in clever ways to save on your energy bills, look no further than the residential awning. Awnings lower energy bills by providing shade for your windows. They block some of the sun’s harmful direct rays, and stop heat and moisture from getting trapped in your home to an extent. Studies conducted by The American Society of Heating and Air Conditioning Engineers and The National Bureau of Standards have shown that residential awnings can reduce the interior heat in homes by 65% when windows are facing south and 77% when windows face the west. When you have a residential awning installed, you increase your usable living space by adding a canopy to areas including decks or patios. This expands your living space because it means that you can get more use out of these areas which may have gone unused during particularly hot or rainy weather. Using an awning to protect vulnerable areas such as decks or patios serves not only aesthetic and functional use purposes, but is a smart way to protect your investment in your home for years to come. Over time, the sun’s harmful rays can bleach and weaken wooden decks, and take a toll on both outdoor and indoor furniture and even carpeting and furnishing. Awnings help mitigate the effects of sun damage over time.